Medical science has evolved in leaps and bounds over the past few decades, and we are at the cutting edge of a number of exciting treatments for previously devastating diseases and conditions. The speed at which these treatments enter the market depends to a large degree on the success of clinical trial recruitment. Clinical trials are very expensive to run, and for them to work it’s essential to have enough participants to reach meaningful conclusions. In 15-20% of cases, companies are unable to recruit any participants at all, while 50% of trials are delayed because of this problem. These delays cost money, causing losses between $600,000 and $8 million per day according to a study by CenterWatch, and the knock-on effect has a substantial impact on the industry. So, what are the reasons for the challenges associated with recruiting and retaining patients in clinical trials? Research shows much of the problem revolves around awareness. Statistics indicate 57% of U.S. adults have never seen an advertisement for a clinical trial, while 50% have never even heard of the concept. In the UK, the numbers are even steeper with a full 85% of respondents completely unaware that they can participate in these trials. This statistic is surprising when we consider that 75% of UK respondents said they would be willing to take part in a trial if they were offered the opportunity. Another problem is the negative press some clinical trials have received in the past, such as a 2006 trial on subjects who became known as ‘elephant men’. Six participants ended up in critical condition. This story is still quoted by the press, and when combined with plots used in films and TV shows, it has promoted the idea that clinical trials can literally be a dance with the devil. Pharmaceutical companies are at a disadvantage when it comes to raising awareness of clinical trials, as typically they don’t market to the prospective participant. Recruiting for trials is a direct B2C (business to consumer) operation, which pharma are ill-equipped to do, mainly because they allocate limited budgets to the important aspects of recruitment while also not being aware of the knowledge gap between prospective participants and medical professionals. These disadvantages mean many companies rely heavily on referrals from doctors, who are often overworked and under pressure with not enough hours in the day. Therefore doctors seldom have time to identify potential subjects for a vast array of clinical trials out there, unless the trial relates to a branch of medicine they specialise in. Even when recruitment is successful it’s often short-lived, with typically a quarter of participants dropping out before the end of the trial. Historically, enrolment in clinical trials dropped by 16% between 2000 and 2006, while retention slumped by 21% during the same period, resulting in more than two-thirds of trials failing to meet their goals. While the financial cost of this result is remarkable, even more so is the potential cost in quality and quantity of lives lost without approved treatments. The outcome of this situation is that clinical trials are either not taking place, are being delayed, or costing much more than originally budgeted, limiting the delivery of intelligence needed to bring the drugs to market. Given the importance of clinical trials in the advancement of healthcare, this issue isn’t likely to go away any time soon. We must work together to change the way we approach recruitment and retention in order to find an effective solution that gets life-saving treatment to health seekers. The good news is that there are solutions to be found, if you know where to look. It comes down largely to communication, which admittedly large pharma isn’t all that good at. There’s a huge role for social media and mobile technology to play, if we can overcome the privacy risks and concerns. The importance is finding a way to break down the disconnect that has evolved between health seekers and manufacturers. Whether this requires us to customise information for various cultural groups, leverage social media and mobile technology, build storytelling into healthcare communications, or revisit the way trials are managed, it’s imperative we identify and implement the right solution. 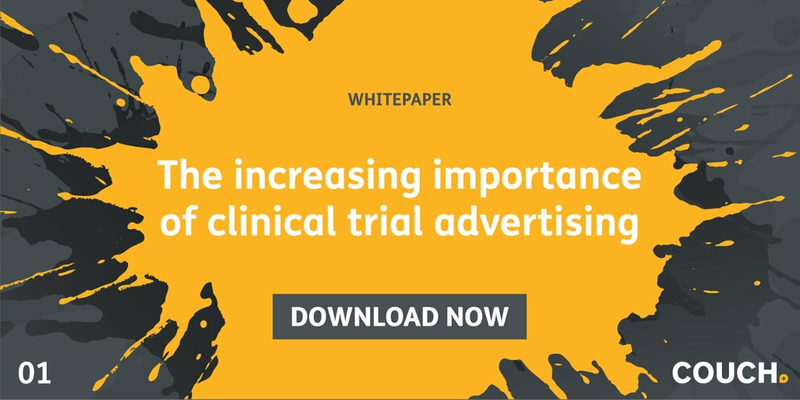 For more information on clinical trial recruitment and retention strategies, please download our white paper here. COUCH is a new breed of health communications agency that, due to a very personal experience, has at its core a mission to improve the lives of everyone. And so we are motivated by the profound understanding that, collectively, we need to do better. We are human to work with because we focus on using our skills and expertise for the common good.